Does My Equipment Require a Gas and Oil Blend? Two-cycle engines in smaller outdoor power equipment like chainsaws, leaf blowers and trimmers need oil and gas. The gasoline fuels the engine, while the oil keeps the engine running by lubricating the cylinder walls and reducing friction. How Much Oil and Gas Do I Need? 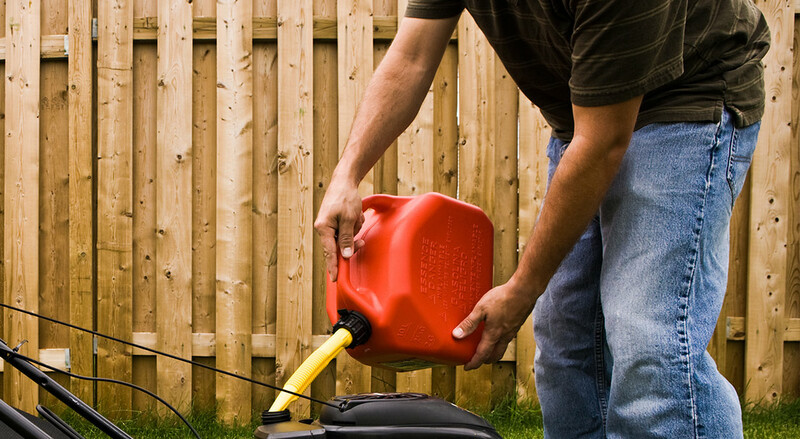 Always use high-quality gasoline and two-cycle oil for your equipment engines. Many two-cycle models require a 40:1 gas-to-oil ratio (i.e. 2.6 fluid ounces of two-cycle oil for every one gallon of gas), but some older models may require a 50:1 or 30:1 ratio. The equipment’s recommended ratio is usually listed on the engine housing. If you don’t see it there, check the owner’s manual. How Do I Mix Oil and Gas? Never mix the oil and gas directly in the fuel tank. Always mix in a separate, leak-proof container that’s slightly larger than the volume of gas and oil required, and make sure the container is free of dirt or any other materials. First pour the premeasured oil into the empty container, then pour in the appropriate amount of gasoline. Seal the container and then swirl the mixture until the liquids are evenly combined. Do not shake. Well-blended gasoline will have even shading throughout and no light or dark streaks. Once fully mixed, carefully remove the cap and fill the fuel tank. If the mixed fuel has sat unused for a while, be sure to swirl the mixture in the container before fueling. What Happens if I Use Too Much Oil? Or Not Enough? Using the proper oil-to-gas ratio is important, but if you’re off, it’s better to mix too much oil into your engine than mixing too little oil. Excess oil can produce a smoky exhaust, oil leaking out of the muffler, and sometimes loss of power. While not ideal, these issues can be fixed by simply replacing the fuel in the tank with properly mixed fuel. But running a two-cycle engine with too little oil can actually destroy the unit. Oil helps cool the piston and cylinder by keeping them evenly lubricated. Without lubrication, the metals can melt and potentially grate against each other, transferring metal to and from one another and permanently distorting them. Loss of engine power is a strong indicator that this has occurred. Can Oil and Gas Mixtures Go Bad? Yes. Don’t store any fuel – mixed or unmixed – for longer than 30 days. Old gasoline can hurt an engine’s power output, cause buildup and blockage in engine parts, and make starting more difficult. Storing gasoline with a fuel stabilizer can help extend the life of the gasoline. Keep in mind, some two-cycle oils include fuel stabilizer so make sure to check the bottle first. What’s the Best Fuel for My Engine? Fuel specifications vary by manufacturer, so always refer to your owner’s manual for fuel recommendations specific to your equipment.